RG Herald: Garcia Sworn in to RGCCISD Police Dept. Garcia Sworn in to RGCCISD Police Dept. 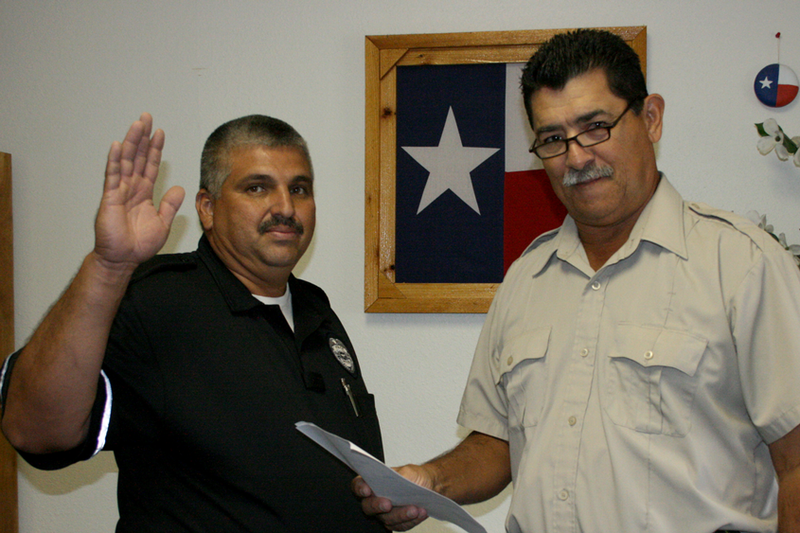 Officer Juvencio Garcia, Jr. was sworn in on September 8, 2010 by RGCCISD School Police Chief Hernan Garza. Officer Garcia brings to the school district extensive experience in Law Enforcement. He was employed at the Starr County Sheriff"s Office for the past nine (9) years. He began his law enforcement career in 2001 as a patrol officer and was promoted within two years to Night Supervisor and later became an Investigator. Officer Garcia is married to Miriam Garcia and they have three children; Nenci (17 yrs. ), Nayeli (14 yrs.) and Andres (7 yrs.). Garcia is a dedicated individual who will undoubtedly be an asset to the RGCCISD Police Department. Pictured are Garcia and Chief Garza. (RGCCISD Photo).